Located on the Italian Riviera, Riomaggiore, Italy is a charming village perched on a terraced hillside high above the Ligurian coast. 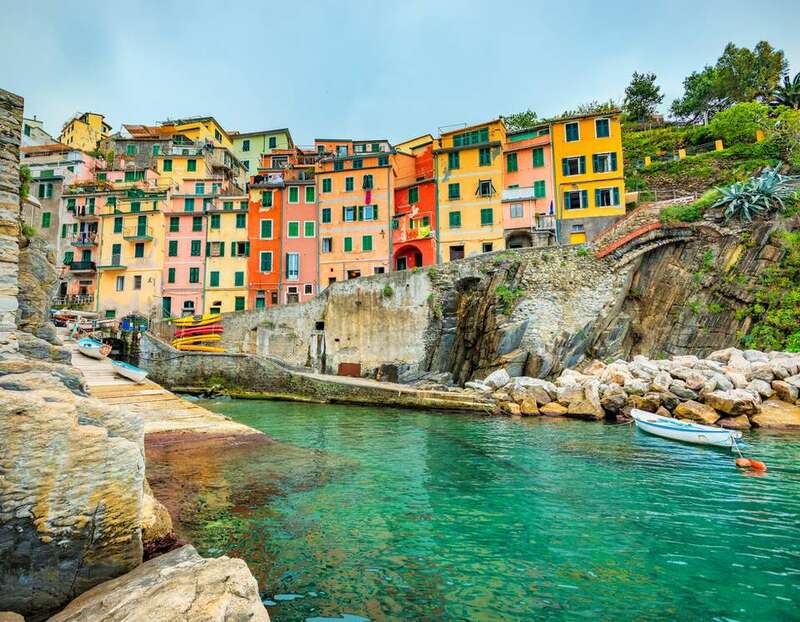 Known for its colorful stone houses that seem stacked on top of one another, and its harbor filled with traditional fishing boats, Riomaggiore is part of the string of five villages that make up the Cinque Terre, a UNESCO Heritage Site. It's also one of the most sought-after travel destinations in all of Italy. The village was originally founded in the 8th century by Greek refugees anxious to take advantage of the naturally rich soil and plentiful sea life surrounding it. The Riomaggiore that we see today, however, actually dates back to the 13th century. It sits in a valley between two steep hills and was named for the stream, Rivus Major, that flows beneath it. Once under the rule of the Republic of Genoa, Riomaggiore relied heavily on producing wine and olive oil from the surrounding vineyards and orchards. Today its main industry is tourism, with more than two million visitors coming to the town each year. Riomaggiore is a wonderful place to enjoy fabulous vistas and slowing down to the pace of Italian village life. Stroll along the main street of the village that leads down to the sea, where a small marina framed by lovely pastel houses is filled with brightly hued fishing boats. It's the perfect spot to sit and breathe in the fresh sea air. Hike Via Dell’Amore (The Way of Love): Via dell'Amore is a footpath that begins in Riomaggiore and leads to the village of Manarola. Cutting along the cliffs above the magnificent coastline, it's the shortest of all the Cinque Terre paths (an easy 15- to 30-minute journey). The path is decorated with nets suspended from the rocks – lovers write their names on padlocks, hang the locks in the nets and toss the keys into the sea as a gesture of eternal devotion. At the path's terminus, it meets up with the Sentiero Azzurro (The Blue Trail), a 7.5-mile network of paths that stretch between the towns of the Cinque Terre. Note: As of this writing (April 2019) the trail is closed for repairs, but is expected to reopen in the spring of 2021. Until then, you can reach the other villages of the Cinque Terre, Manarola, Corniglia, Vernazza, and Monterossa al Mare, by train. Admire the View From the Medieval Castle of Riomaggiore: Castello di Riomaggiore is located at the highest point of the village and open to the public – its terrace offers sweeping views. The castle was constructed beginning in 1260, in order to protect the town from barbarian and pirate attacks. Visit the Church of San Giovanni Battista: This Gothic church was erected in 1340 and was renovated in the late 19th-century following a minor collapse. Among its collection of masterpieces is the painting by Domenico Fiasella, "Preaching of John the Baptist," a wooden crucifixion by Maragliano, and a mechanical organ built in 1851. See Precious Relics in the Oratorio di Santa Maria Assunta: Near the castle is the 16th-century Oratorio di Santa Maria Assunta (also known by locals as Chiesa dalla Compagnia). Located in the center of town on the main street, Via Colombo, it was built between the 15th and 16th centuries. The church contains a triptych (a picture relief carved on three panels) of Jesus, the Virgin Mary and Saint John the Baptist and, of course, a wooden statue of the Madonna. Stroll Along Via Colombo: From the Oratorio di Santa Maria Assunta, take a walk along Via Colombo, the village’s main street. Rife with restaurants, bars, and artisan shops, it connects the upper part of Riomaggiore with Piazza Vignaioli. From this square, you can easily reach the picturesque harbor. The traditional dishes of Liguria are dominated by the ingredients naturally sourced from the surrounding terraced fields and the sea. Below are a few of the typical foods and drinks you'll find in Riomaggiore's local trattorias and bars. Anchovies (acciughe) are a delicacy in these parts, fished from these waters at least since Roman times. The lampare (anchovy fisherman) use lamps at night to lure the fish into their nets. You'll find restaurants serving anchovies fried with a coating of egg, Parmesan cheese, and herbs, as well as dried, salted and preserved in oil (sott'olio). Pasta alla Genovese is pasta with a classic, bright-green sauce made from basil from Genoa, pine nuts, Parmigiano-Reggiano and Pecorino cheese, plus garlic, salt and olive oil. Most commonly used to dress penne pasta, it is designated by the E.U. as D.O.P (Protected Designation of Origin). Focaccia is a Ligurian flatbread that can be flavored or baked plain with a little olive oil and salt sprinkled on top. Served everywhere, it is even eaten at breakfast alongside a cappuccino. White wines made in this part of the Ligurian coast are dry with herbal notes, perfect for pairing with seafood. Typically made of Bosca, Albarola or Vermentino grapes, there are more than 26 local producers so you're sure to find plenty of varietals from the area. Sciacchetrá is a local dessert wine made through an ancient method whereby grapes are dried in the sun to produce the highest possible sugar concentration. You'll find the sweet wine served at special occasions with cheese or cake. There's even Sciacchetrá museum in nearby Manarola. If you're thinking of staying in Riomaggiore you'll need to make reservations far in advance. Hotels and B&Bs are limited in number, and it's virtually impossible to find a room when summer when crowds are at their peak. If you want to avoid the throngs of tourists and the sweltering heat of the high season, consider visiting in the early-to-late autumn, when temperatures are mild and crowds are somewhat thinner. Winter can also be a wonderful time to visit Riomaggiore, particularly if you're the type of traveler that doesn't let a little rain dampen your enjoyment. Some top-rated hotels in Riomaggiore include La Scogliera and Hotel del Sole. By train: Situated at the southernmost point of the Cinque Terre, Riomaggiore can be reached by train from either La Spezia or Levanto. From La Spezia, take the local train (treno regionale) in the direction of Sestri Levante and get off at the first stop. From Levanto, take the regional train in the direction of La Spezia Centrale. In five stops you've arrived at your destination. If you want to save money and time, purchase the Cinque Terre Card Train (Treno), which includes the use of the ecological park buses, access to all trekking paths and Wi-Fi connection, plus unlimited train travel on the Levanto – Cinque Terre – La Spezia line (regional, second-class trains only). Prices for an adult 1-day pass vary depending on the time of year, but are currently (as of April 2019) priced from €13 to €16; 2- and 3-day passes, discounted children's passes and family passes are also available. By car: Riomaggiore, like all the villages of the Cinque Terre, is closed to traffic. If you're planning to drive, you'll find there are several small parking facilities outside Riomaggiore and Manarola with shuttle buses into town. Keep in mind that lots fill up fast, therefore we recommend that you use the parking lot on the seafront in Monterosso al Mare or the parking facility in Levanto instead. By plane: The nearest airports are Genoa's Cristoforo Colombo (GOA), Pisa's Galileo Galilei (PSA) and Florence's Amerigo Vespucci Airport (FLR). The closest and largest international airport is Malpensa International (MXP) located in Milan.